Area 133 A. 2 R. 4 P.
Anne O’Hara Anne O’Hara Private dwelling with 3 rooms. Malachy Greahan Malachy Greahan Public House with 4 rooms. Eleanor Gallagher Eleanor Gallagher Private dwelling with 2 rooms. Joshua Murphy Joshua Murphy Private dwelling with 3 rooms. Patrick St.Leger Higgins Patrick St.Leger Higgins Private dwelling with 6 rooms. Catherine O’Connor Catherine O’Connor Private dwelling with 4 rooms. John McCann Catherine O’Connor Private dwelling with 4 rooms. Michael Frehan Michael Frehan Private dwelling with 4 rooms. Martin Langan Martin Langan Private dwelling with 3 rooms. Bartholomew Cawley Private dwelling with 2 rooms. Anne Reilly Private dwelling with 2 rooms. Thomas Haverty Private dwelling with 1 rooms. Terence Cramptom Private dwelling with 2 rooms. Bridget Carty Private dwelling with 2 rooms. Edward Egleton Private dwelling with 2 rooms. Thomas Walsh Private dwelling with 2 rooms. Patrick O’Connor Private dwelling with 2 rooms. Winnifred O’Brien Private dwelling with 1 rooms. Patrick Higgins Patrick Higgins Private dwelling with 3 rooms. Matthew Travers Shop and Post Office with 4 rooms. John Heneghan Private dwelling with 2 rooms. Michael Corbett Private dwelling with 2 rooms. Patrick Hartigan Private dwelling with 2 rooms. Thomas Martin Private dwelling with 2 rooms. Patrick Kelly Private dwelling with 2 rooms. Catherine Pendergast Shop with 2 rooms. Michael Casey Private dwelling with 2 rooms. Mary O’Rorke Mary O’Rorke Private dwelling with 3 rooms. John Tedders Private dwelling with 4 rooms. Walter Morrin Shop with 3 rooms. Thomas Donohue Private dwelling with 3 rooms. Anne Martin Private dwelling with 2 rooms. Bridget Gavan Bridget Gavan Private dwelling with 2 rooms. Michael J. O’Neill Michael J O’Neill Private dwelling with 3 rooms. Mary Fallon Mary Fallon Private dwelling with 4 rooms. Richard Geraty Richard Geraty Private dwelling with 2 rooms. Ellen F Golding Ellen F Golding Private dwelling with 5 rooms. John Garvey John Garvey Private dwelling with 3 rooms. Michael Craddock Michael Craddock Private dwelling with 3 rooms. Bedelia Morriss Bedelia Morriss Public House with 4 rooms. Lawrence Kain Private dwelling with 3 rooms. Richard Kain Richard Kain Public House with 4 rooms. Martin Egan Shop with 4 rooms. Patrick Ceary Patrick Ceary Shop with 3 rooms. Patrick (Sgt.) Wimsey R.I.C. Barracks with 4 rooms. Members of R.I.C. R.I.C. Barracks with 4 rooms. Click on the Griffiths Valuation Page # 152 to see a list of tenants with plot numbers to match the Griffith map. The map has each renters plot numbered and recorded in the Valuation book so the exact location of your ancestors plot can be ascertained. 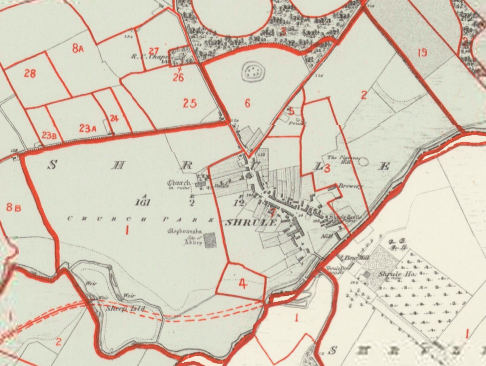 Click on the Griffiths Valuation Ballinrobe Page # 152 to see a list of tenants with plot numbers to match the Griffith map. Situated in the South of the parish. It is bounded on the N. by Ramolin td. ; W. by Cloonbanaun td. ; S. by the parish of Donaghpatrick in County Galway; and E. by Dalgan Demesne. It contains 161a. 2r. 12p., and is the property of Patrick Kirwan, of Dalgan. agent, Charles Cromie, of Annefield. The soil is a light sandy clay, with limestone bottom. The town of Shrule is situated about the centre of this td., and there are held here a weekly market and 3 fairs in the year. Tenants pay from 36s. to 40s. per acre yearly. Such of them as build good houses in the village have a rood of ground attached under a lease of 3 lives at a rent of £3 per annum. There are in the village 9 public houses and a police station, together with a police station and a brewery. The latter has been built, and is occupied, by Wm. Golden, Esq., who holds it under a lease of 999 years at a rent of £30 per annum. The antiquities here are an old castle, an old fort, an old church, and the site of an old abbey. Near the N.E. corner of the latter is a large stone called Cruckvahina, or the Blessed Stone. (Clock Bheannuighthe, the blessed stone).